Let the new line take you on an a dreamy adventure. Renowned makeup artist and Chanel global creative makeup and color designer, Lucia Pica channeled major vacation vibes for "Travel Diary," the luxury brand's fall-winter 2017 makeup collection. 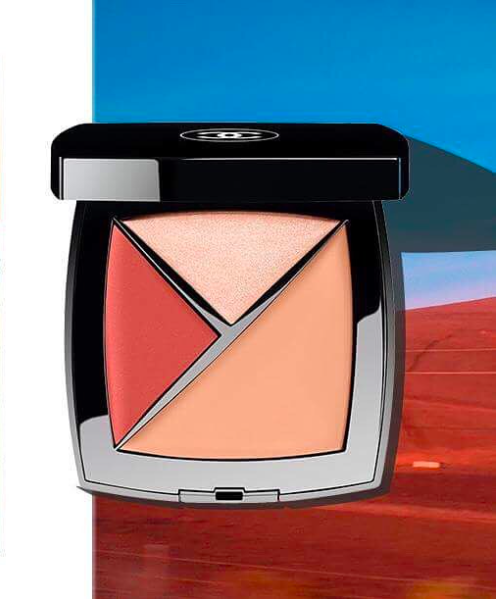 Inspired by Pica's recent California road trip, vibrant horizons are reimagined into poppy lip colors and rustic landscapes into earthy palettes and shadows. Travel along her journey with a peek at some of the highlights from the collection, below. This bright, bold lip color is a guaranteed head-turner. Though matte in finish, it contains jojoba oil and shea butter, guaranteeing to stay on all day without a drying effect. This neutral shadow complements any eye color or skin tone and its smooth, creamy, texture offers a beautiful satin finish. Two compact eyeshadow palettes—appropriately named "City Lights" and "Road Movie"—are reminiscent of lights that glimmer during California nights, with iridescent shades of purples and greens. This 3-in-1 palette has everything needed to color, conceal, and highlight for a fresh-faced look. Use it to conceal imperfections, add color to cheeks and lips, and highlight eyes or cheekbones to create a youthful, dewy finish. Pica's full collection also takes a new approach for fall, including a variety of unexpectedly soft nail colors including sage green and muted lavender.